1. Table clamp for attaching a reading magnifier or additional lighting (e.g. super-lite Item No. 2090 light set) to a table top or directly onto the reading material. 2. 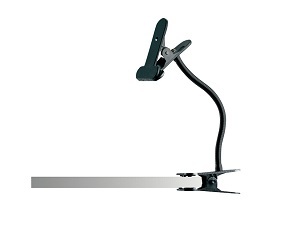 The flexible, black gooseneck metal arm allows reading magnifiers to be placed in almost any position. 3. Length of metal arm: 330 mm. 4. The plastic clamps on each end have rubber inserts. 5. Suitable for tables top with a thickness of up to approx. 4.5 cm.